If you’re excited to spend the warmer months outside this spring and summer, entertaining, gardening, playing games, or just relaxing, a well constructed outdoor living space is crucial for optimizing your time, comfort, and level of enjoyment. An outdoor living space can take your backyard from good to great, enhancing the value of your home, and providing hours of fun, excitement, and relaxation. Whether you love to invite the neighbors over for lavish barbecues, or just kick back with a cold one in the evenings and watch the kids play, you can create the perfect outdoor living space for your preference and budget. Here are some of our favorite ideas for transforming your backyard into a private “staycation” destination for summer. The Deck. Give yourself the gift of space with a deck. If you’re looking for the perfect place for the grill and a convenient spot to entertain while keeping an eye on the entire backyard, a deck is one of the easiest ways to have it all. Decks are simple to plan, relatively inexpensive to build, and they take no time at all to complete. If your goal is to get outside quickly and enjoy your outdoor living space as soon as you can, a deck is a great option. The Patio. If your backyard is directly adjacent to your backdoor, adding a patio will individualize your space, provide an attractive transition from inside to outside, and create a welcoming outdoor area for relaxing, hosting, and more. 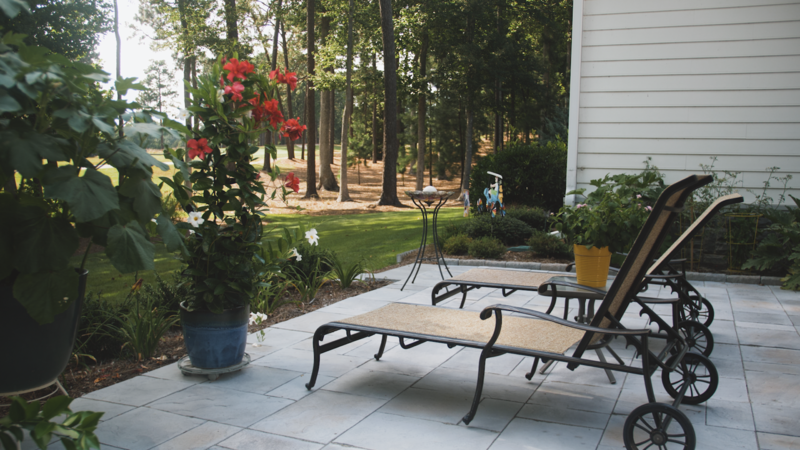 A patio can be elevated a few inches off the ground or be relatively flush with your yard. Create patterns with differently sized and shaped bluestone, flagstone, slate, limestone, pebbles arranged in spirals, or clay bricks laid in a unique pattern. Enhance the value of your home and bask in the beauty of your brand new patio. The Poolside Oasis. If you have a pool already or have been considering putting one in, don’t just settle for a water-filled cement hole in the ground. A little bit of landscaping and strategically placed furniture around the pool can make your backyard feel like an oasis, providing a shady respite from the sun, a convenient place to dine or snack, and privacy from any nosy neighbors or passersby. Magnolia, banana, and citrus trees, as well as lattices with climbers or vines, wildflowers, ferns, succulents, and ornamental grasses can all be strategically landscaped around the pool to create the perfect poolside oasis. Avoid overly leafy trees, pine trees, and flowering plants near the pool to minimize cleaning time, and put out a table, umbrella, and pool chairs to maximize poolside fun. The Screened Porch. During warmer months, a screened-in porch can serve as a indoor-outdoor living room, dining room, playroom, and even bedroom. The roof helps the area remain relatively dry, and the screen keeps bugs to a minimum, creating a haven in hot, humid, mosquito-ridden climate zones. Install ceiling fans to keep air moving, and get creative with furniture selection. A comfortable couch or lounge chairs are ideal for reading or napping, and outdoor rugs are easy to keep clean and can beautifully tie the room together. Plant flowers or tomatoes in pots around the periphery, and consider training climbers or vines along the outside on a trellis or lattice. This summer, your backyard can be the ultimate neighborhood destination, or your very own well-kept secret shared only by you and your closest friends. Get the most out of your time at home with a custom created outdoor living space. How can we help you build your own dream haven?